"What a woman does for her children, what a man does for his family, what people most tenaciously cling to, these things are not adequately explained by Oedipus complexes, libidos, class struggle, or existential individualism – whatever you like. Now I know that psychoanalysis has found . . . the unconscious. A writer is supposed to go there and dig around like a truffle hound. He comes back with a truffle, a delicacy for the cultural world. Well I don't believe that. . . That's not the way it really is." "The living man is preoccupied with such questions as who he is, what he lives for, what he is so keenly and interminably yearning for, what his human essence is." 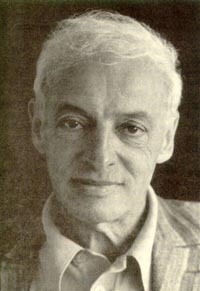 Saul Bellow was 80 when he nearly died. Poisoned eating toxic fish while visiting the Caribbean in 1995, he developed near fatal pneumonia. Only an extended, exhausting effort by his fifth wife, Janis, returned him to health. More than 50 years had passed since his first book was published and it had been 19 years since he had earned the Nobel Prize for literature. For most, advanced age, the near death experience, and an extended recuperation would have signaled the end of a long and successful career as energy and intellectual powers drained away. Not so for Bellow. He became recharged. He published The Actual in 1996 and Ravelstein in 2000 - the later a major work based on the life of friend and colleague, Allan Bloom. In 1999, an 84 year old Bellow celebrated the birth of Naomi Rose, his fourth child and first daughter. Abram and Lescha (Gorfin) Belo emigrated from St. Petersburg, Russia in 1913 settling in Lachine, Quebec, an immigrant working class suburb of Montreal. Abram first imported Turkish figs and Egyptian onions before becoming a bootlegger. Their fourth child, Saul, was born, June 15, 1915. Before he was four, the family relocated to a mostly Jewish slum in Montreal where Lescha enrolled him in Hebrew school, hoping he would grow up to become a rabbi or Talmudic scholar. Watching neighbors die during the Great Influenza plague of 1918, a bout with tuberculosis that put him in a Royal Victoria Hospital ward for six months, a beating and the near arrest of his father for bootlegging, the family's escape to Humboldt Park Chicago in 1924, and the loss of his mother when he was 17 were all traumatic for the bookish, diminutive Saul.